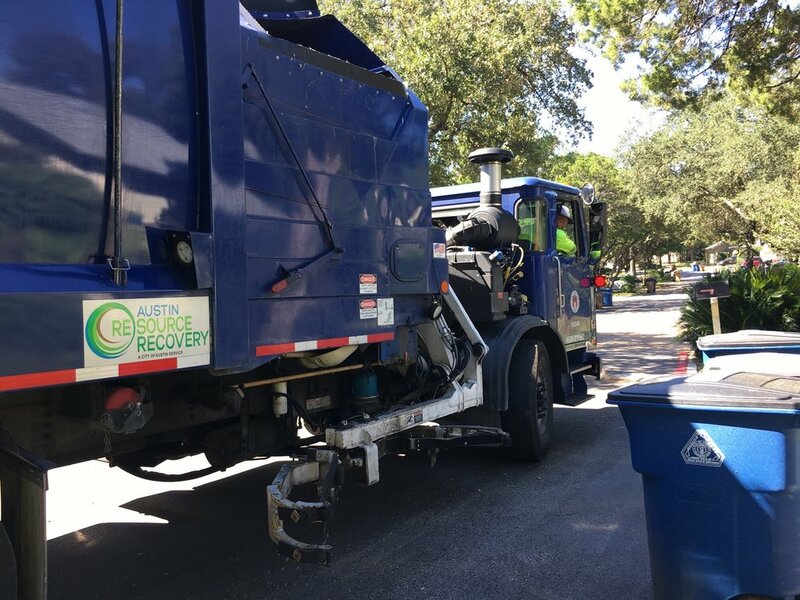 Austin Resource Recovery (ARR) is the City of Austin department that manages residential waste and recycling services. Austin’s recycling rate is currently at around 42%, but the city has an ambitious recycling goal of 90% by 2040 (3). ARR's teams collected quantitative data through surveys and route data, but the data couldn't tell them why recycling was slowing, how residents perceived recycling and how people managed waste in their own homes. Austin Resource Recovery partnered with City of Austin Design, Technology, & Innovation Fellows to develop insights on resident recycling perspectives and behaviors and to design solutions for addressing recycling challenges. The team included myself, researcher/lead designer; Katherine Duong, lead researcher/designer; Marni Wilhite, project manager; Amalie Barras, data analyst/designer; Ron Neumond, researcher and program development. We took an iterative approach to design. Out of over 160 ideas, we selected 8 to prototype, had 2 failed prototypes early on, and spent several weeks building, testing, and refining 5 products. Content for this section is based on our recommendations guide with contributions from all team members. Research Insight: Single stream rules are so confusing that almost nobody does it perfectly. Product: We created a beginner’s guide to proper disposal in Austin. The guide addresses confusing items. If residents want additional information, they can turn to more advanced resources like What-Do-I-Do website or Recycling and Reuse Drop-off Center brochure. Research Observation: Austin Resource Recovery volunteers and team members spent most of their time educating people at outreach events. Product: The sorting game is a welcoming and playful way for team members to observe resident's recycling knowledge, answer questions, and prompts them to give the resident the right level (basic or expert) of recycling educational material. Research Insight: When space is limited, making room for recycling feels like a personal sacrifice. Product: The Dual Bin Program teaches residents how to recycle and gives them a complimentary dual recycling and trash bin so they can put their new knowledge to use and start forming habits. The program is modeled after the Compost Rebate Program. Framework Insight: Residents need strength in 2 out of 3 framework areas (knowledge, ability, motivation) to recycle. Product: The outreach tool gives Austin Resource Recovery staff and volunteers a way to assess knowledge, ability, and motivation at outreach events. Instead of feeling pressured to teach residents everything about recycling, this tool enables team members to listen in a structured way and quickly assess what the resident needs. Research Observation: Austin Resource Recovery needed a reliable reference tool for recalling personas and applying them to programs & content. Product: The Content Strategy guides Austin Resource Recovery teams and partners in drafting proposals, planning programs and campaigns, and creating content. Artifacts created to support the content strategy includes a Content Canvas, an Editorial Calendar, and Persona Posters. We created a recommendations booklet that includes a brief history of each prototype, test details, and finished products with instructions for next steps. Most importantly, Austin Resource Recovery teams can access this booklet and use it in their daily workflow. Research began with recycling route ride-alongs. I learned working a route is one of the most dangerous jobs in the U.S., ranked not far behind loggers and aircraft pilots. You begin to understand that when you get a peek inside a route truck. A driver manages his route, coworkers, driving on the right instead of the left, and worst of all–fear of injuring a cyclist or homeowner with the cart arm. Still, there's prestige to working the recycling routes vs. trash. Johnnie, one of the route supervisors told me, "Police officers protect you, firemen keep you safe, EMS gets you to the hospital. We save the world." To Johnnie, recycling is not just providing a necessary and dirty service, he feels a responsibility to usher in a cleaner future. Field Research included four weeks of interviews, activities, and observations in resident's homes. Activity 4: draw a reflection timeline including all the times they needed to dispose of something during their day. Residents opened our eyes to how complicated recycling has become and what recycling means to them. We interviewed 52 residents and 3 property managers, and developed a framework from their experiences. See our presentation to see more of their stories and the framework or click here to watch videos from our interviews. The research learnings were a foundation for generating ideas that addressed Austin’s unique recycling challenges. We generated over 160 ideas with our partners then evaluated them twice: first by resident values then by partner needs like feasibility and timeline. We shared process work through many channels, hoping to share our methods, pitfalls, and learnings with other practitioners, government teams, and residents. Public Presentations: More than a presentation, these are our chances to share work and get feedback from the public. We took advantage of public spaces, like City Hall and Carver Library, that had free parking and feel welcoming. Each presentation involved making promotional materials, preparing a deck or visuals, and coordinating with a news source to film and post online for people who cannot attend. Medium: Writing platform where we shared our personal reflections on methods and process, on what it’s like to conduct research and prototype in city government, and on keeping open lines of communication.